Help Us with Our $10,000 Matching Challenge! Adelaide is hoping that you will help the rescue horses in Mylestone's Help A Horse Day $10,000 challenge. That's a lot of horse treats, she says. This year, we have an incredible opportunity to raise a lot of money for the horses – one of our generous donors is offering to match all donations made up to $10,000! 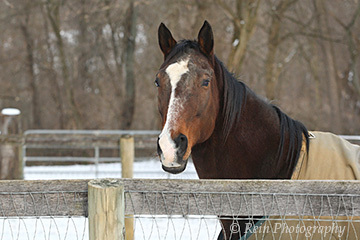 People can send donations through the mail, PayPal, or go to Horsemen’s Outlet on the 28th, but it must be noted that the donations are for Help A Horse Day. 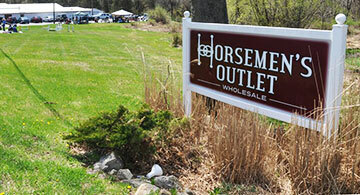 There will be prizes offered by Horsemen’s Outlet along with a huge tent sale taking place the day of our event. We are also hosting a food drive for the Calvary Bible Fellowship food pantry, bring a nonperishable item of food and be entered to win a Horsemen’s Outlet gift card! 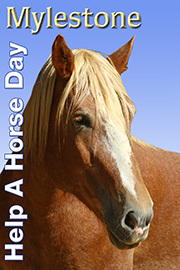 Stop by and help our Mylestone horses win big on Help a Horse Day, April 28th! Any donation you make - directly to Mylestone or at our bake sale, merchandise table, etc. - so long as it’s indicated for Help A Horse Day - will all qualify to be matched by our very generous donor up to $10,000!! We’ve never had an opportunity like this before, so let’s make it count!! If you can’t make the event, please make a donation and indicate it's for Help A Horse Day. You can also send a check by mail (Mylestone Equine Rescue, 227 Still Valley Rd., Phillipsburg, BJ 08865) and just mark HaHD in the memo for your funds to be counted for this event. We truly need your support for Mylestone's rescued horses, those who are in need of, and are waiting for, our help, and all our efforts on behalf of horses.